Don’t miss out! Breakfast, Lunch, Dinner, Prizes and let’s not forget GOLF! Thanks to all Sponsors and Players! It is a great opportunity for Sponsors and Participants to play golf at The Oaks Club Valencia while supporting a very worthwhile cause. 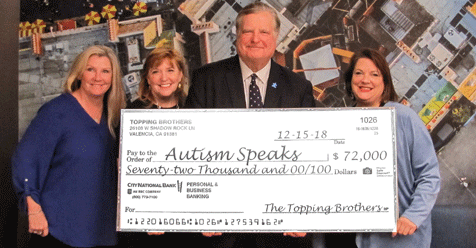 The Topping Brothers raise money for those struggling with autism now. The net proceeds raised goes directly to Autism Speaks for such things as, Advancing Breakthroughs in Autism Research, Increasing Global Understanding and Acceptance and so much more. While supporting Autism Speaks is our main goal at this point. We are planning a foundation with longer term battle plans such as providing scholarships for families that cannot afford the therapies that are available. Visit our site to register for this event, become a sponsor, or donate!